Farooq Kperogi, media scholar and newspaper columnist has described Amina Zakari’s comment on being a sister or blood relation to President Muhammadu Buhari as untrue and totally ‘mendacious’. 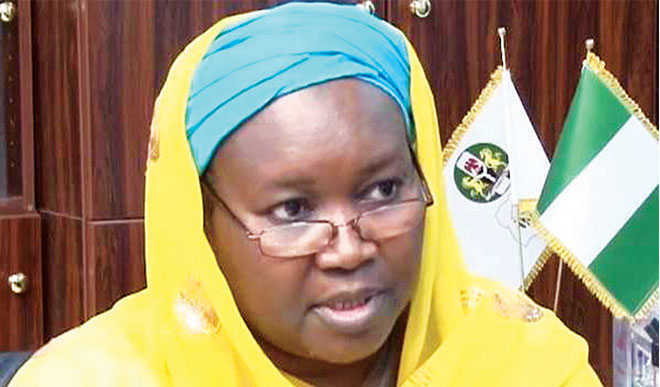 This is as the head of the Independent National Electoral Commission (INEC) collation centre for the general elections (Zakari) recently, in an interview with BBC clarified that she is not Buhari’s Cousin nor sister, Naija News reports. In his words, Kperogi said, Amina Zakari just said to the BBC, “I’m not [Buhari’s] niece.” That’s flat-out mendacious. And it puts a huge question mark on her honesty, probity, and trustworthiness. A person who can lie this casually about something as basic and as verifiable as her relationships is disreputable and unworthy of the responsibility she’s been entrusted with at INEC. So what is the truth? In a December 27, 2018 article, Mohammed Haruna, former Daily Trust columnist and current INEC commissioner, confirmed that President Muhammadu Buhari’s biological sister was once married to Mrs. Amina Zakari’s father. That makes Amina Buhari’s niece. This is the definition of a niece in the Oxford English Dictionary: “A daughter of one’s brother or sister, or of one’s brother-in-law or sister-in-law.” Amina’s father was Buhari’s brother-in-law. So Amina IS INDEED Buhari’s niece. But that’s not all. At some point in his youth, Buhari, who lost his father at a young age, came under the guardianship of Amina’s father, the late Alhaji Hussaini Adamu, who was emir of Kazaure, Daura’s “next-door neighbor.” I had the pleasure of interviewing Mrs. Amina Zakari’s brother, Alhaji Najib Hussaini Adamu, in early 1999 shortly after he became emir, when I was a reporter for the Weekly Trust. I stayed at the palace for days. So I have some familiarity with the family. It has also been established by several people I spoke with today that Amina Zakari was nominated to INEC commissionership by Buhari. This fact, as I pointed out in my Saturday Tribune column, isn’t enough to vitiate her neutrality. After all, Jonathan defeated Buhari in 2011 while she was INEC commissioner. But deceiving the world by concealing the nature and depth of her relationship with Buhari shows that she’s up to no good this time around. Another evidence of Buhari’s continuing relationship with Amina’s family exists in the fact that Mrs. Amina Zakari’s biological brother, Alhaji Sulaiman Adamu, is Buhari’s Minister of Water Resources. In both African and Western kinship dynamics, Buhari and Amina Zakari are related. If Nigeria were a functioning country, Amina would have recused herself from her current role at INEC in view of the widespread concerns raised by several stakeholders about her ties with Buhari. But Nigeria is an anything-goes banana republic. Also note that Amina’s brother, that is, the current emir of Kazaure, whom I interviewed and interacted with in 1999, was executive secretary of PTF. Buhari gave him the job. Ambassador Kazaure, Buhari’s Chief of Protocol, is also a relative of Amina’s. Finally, as most people know by now, Amina’s mother is from Daura, Buhari’s hometown. So her ties with Buhari are pretty strong.